Synthetic Vision replaces an airplane's traditional horizon display with a detailed view of the terrain and any approaching obstacles. The system combines GPS, a high-resolution display and detailed databases. The system also has an integrity monitor (inset) that ensures the land below corresponds to the synthetic view. Year after year, it's one of the leading types of airplane accidents: controlled flight into terrain. Pilots cannot see obstructions or they lose the horizon, and fatal accidents occur. NASA and its industry partners have developed technology called Synthetic Vision that could nearly eliminate those accidents, said Dan Baize, NASA's project manager for the effort. Inspired by the Federal Aviation Administration's goal of reducing fatal accidents by 80 percent, Synthetic Vision marries several technologies to provide pilots with perfect visibility regardless of the weather or time of day. "We have many of these accidents caused by low visibility where flight crews get confused," Baize said. "They're just a little bit lost, and they fly a perfectly good airplane into the ground or into an obstacle." Synthetic Vision combines a high-resolution display, databases of terrain and Global Positioning System technology to show pilots exactly where they are and how the plane is oriented. The system also has an integrity-monitoring system that ensures that the information Synthetic Vision is displaying corresponds to where the plane actually is. The basic idea for Synthetic Vision has been around since the 1950s, but until recently implementing it had not been technologically possible, Baize said. 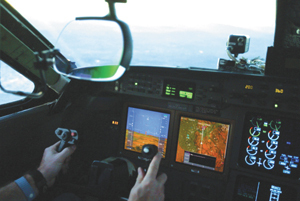 Virtually all avionics companies are preparing to launch Synthetic Vision products, Baize said. The first generation of synthetic vision is available from Chelton Flight Systems of Boise, Idaho. Chelton is part of Cobham plc of Wimborne, England. The business jet industry likely will be an early adopter of Synthetic Vision, and others will follow, said Tim Etherington, a systems engineer with Rockwell Collins Inc., one of NASA's industry partners on the project. Synthetic Vision is expected to eliminate the types of accidents that happen in all kinds of aviation. Even experienced commercial pilots who have all the instrument and commercial ratings can make mistakes that lead to an accident, Baize said. "It's because the current baseline set of instrumentation requires a mental integration of information to form the picture of where the airplane is in respect to the terrain, airport and obstacles," Baize said. "What Synthetic Vision does is remove the workload of the mental integration and provide the flight crew with a visual picture that gives them all the data they need to remain safe." Synthetic Vision shows the terrain, obstacles, the approach path and runways in a display that looks something like a video game. Databases give pilots photorealistic displays -- even including landmarks such as shopping malls and office buildings -- but the first-generation projects likely will have more generic displays, Baize said. "Our research shows the more generic texturing techniques are actually more effective at conveying information," Baize said. "The only time those added features like landmarks become a bonus is if the pilot is extremely familiar with the area. We think it's better to make a much less complex picture." Generic texturing also is less expensive, as it requires less computing power and less detailed databases. Synthetic Vision is more intuitive than the Highway in the Sky system, Baize said. Highway in the Sky is usually a display with a tunnel representation for pilots to fly through. Synthetic Vision is much more detailed. The new system proved itself during a recent test flight in which pilots flew an extremely difficult circle maneuver to approach the Eagle County, Colo., Airport's No. 7 runway. All of the test pilots, with visibility restriction devices in place and using Synthetic Vision, were able to fly a Boeing 757 to a position for an easy landing. "We made this extremely difficult procedure into something they could probably routinely do," Rockwell Collins' Etherington said. Beyond aircraft, Synthetic Vision could have applications in areas ranging from the military to commercial trucking, Baize said. "Air traffic control is a possibility," Baize said. "Controllers are now limited by the visibility available to them and the line of sight they have. A synthetic tower could be created where the proper traffic information would be viewable to them at all times." Synthetic Vision has gone through low-level flight tests on military planes and helicopters, Etherington said. It could be used for military command and control applications too, he said. "Anytime you need a perspective view of what's going on or need to visualize lots of data is a good use of Synthetic Vision," Etherington said.